On this day in 1903, following an unsuccessful attempt three days previous, the Wright brothers once again took their newly-built Wright Flyer to Kitty Hawk, North Carolina, and proceeded to make history by claiming "the first sustained and controlled heavier-than-air powered flight." In fact, they made four short flights that day — two apiece — with the last managing to stay in the air for 59 seconds and cover a distance of 852 feet. 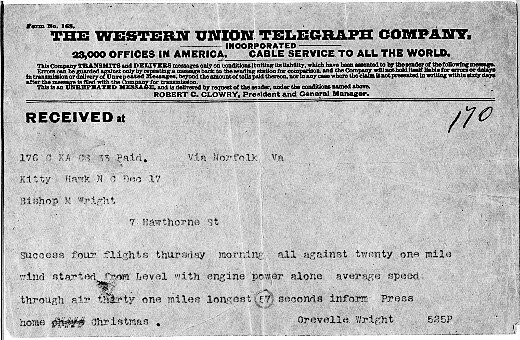 Wishing to inform their father of the good news and make the press aware of the achievement, Orville sent him the following telegram just hours later. Note: During the telegram's transmission, '59' seconds mistakenly became '57', and 'Orville' became 'Orevelle'. Transcript follows. 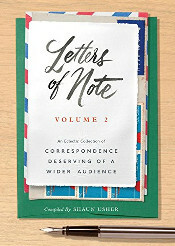 Image courtesy of American Memory.